The Qjoy from Longmada is an ultra compact, lightweight and stealthy cartridge battery set/kit with draw-activated firing for discreet sessions on the go. It has a versatile 510 thread connection with two unique magnetic adapters that makes it compatible with quite a wide range of atomizers measuring up to 10.5mm in diameter. 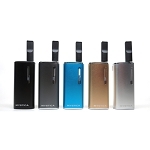 You can upgrade your Qjoy to the Complete Kit to include a premium 0.5mL oil cartridge if you need one. 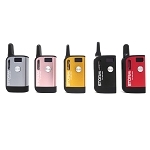 It has a premium ceramic mouthpiece and wickless ceramic element that heats quickly and creates massive vapor. After you have your cartridge connected to the Qjoy Battery all you have to do is draw and it automatically heats your oils. There is an LED power light indicator that will shine while heating for up to 10 continuous seconds at a time. The premium internal 350mAh lithium-polymer battery will keep you going for days at a time. When it is eventually time to give it a recharge it has USB charging cable included in every kit that will have you back up and running in just 30 minutes.